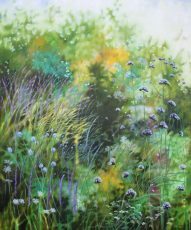 Dylan studied at Falmouth School of Art, graduating in 1994 with a BA (Hons) in Fine Art which lead to a successful teaching career. 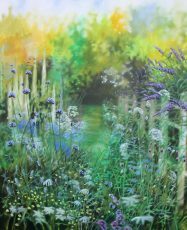 He continued to paint while teaching and has established his credentials as a much sought after contemporary artist. 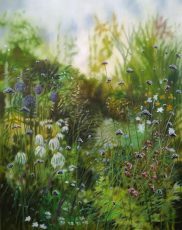 Dylan now works from his studio on the Isle of Portland on the idyllic Dorset coast. 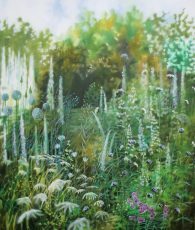 He has become best known for his garden paintings which he first developed in 2002 in response to the beautiful parkland at Canford School in Dorset. 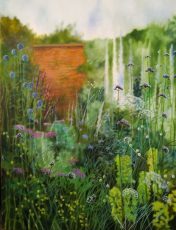 His own garden, the Isle of Portland and the grounds at Clarendon House in Salisbury have provided the inspiration for his recent work. 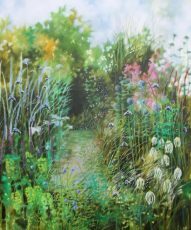 His canvases are an enchanting window onto the lush, verdant growth of an English garden. Borrowing from photography by exaggerating depth of field and using pixilated elements, he creates works with a unique, compelling quality. 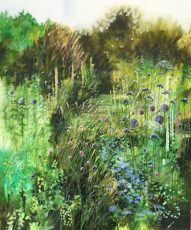 His paintings capture those fleeting movements of beauty when gardens are at their most delightful and sing with tranquil intensity. Our first collection of Dylan’s beautiful work is now in the gallery. You can buy online right now. Don’t forget that you can use Own Art with all of Dylan’s work to spread the cost.